We are committed to up-front, transparent pricing. Our belief is that you deserve as much information as possible when considering a divorce. Knowing what you can expect to pay is crucial for budgeting purposes. Completely transparent and predictable pricing has many advantages. But we know that there is a disadvantage to providing complete clarity on price: sticker shock. It’s not unusual for prospective clients to look at prices and get a bit nervous. However, we are committed to a transparent process. So while other mediators will only give you a price range, we provide a fixed, flat fee price. But we know that our process saves you significant, meaningful amounts of money in the long run. If you’re worried about the price of an uncontested divorce, we’re happy to answer your questions and address your concerns. Please call Split Simple today at (855) 665-9920 for Chicago divorce mediation and uncontested divorce services in Denver. Opacity is a common complaint for people going through a traditional courtroom divorce. Because divorce lawyers charge by the hour and for expenses, it’s pretty much impossible for them to provide you with a clear sense of what you can expect to pay when you hire them. That’s frustrating, but that also means it’s difficult for a lot of clients to wrap their minds around the true cost of a courtroom divorce. They don’t see that true cost until the final bill comes due. 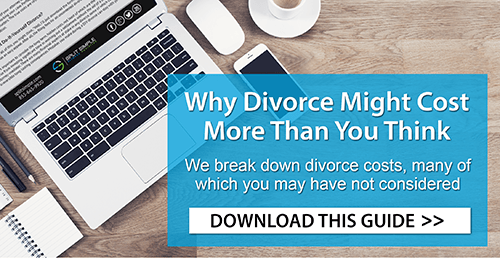 Many people, having considered both the uncertainty of traditional courtroom divorce and the open pricing of our mediation services, opt for do-it-yourself divorce – they find the appropriate documents online, then fill them out themselves. This has a certain appeal, but it’s also a risky endeavor. It takes a lot of time to properly fill out the paperwork associated with a divorce, and it will take even more time to correct that paperwork if a judge refuses to approve your settlement. At Split Simple, we offer cost and time certainty. You can budget for our prices and make plans around our mediation sessions. And the best part is this- the price you agree to pay will be the price you end up paying, with no exceptions. You won’t have to shell out extra for additional services or fees. We handle document completion and submission as part of our core services, and in the unlikely event that a judge refuses to approve your agreement, we will make the necessary changes completely free of charge. If you’re considering a divorce and you’re looking for a completely transparent and understandable pricing structure, please call Split Simple today at (855) 665-9920 or contact us online for Chicago divorce mediation and uncontested divorce services in Denver.